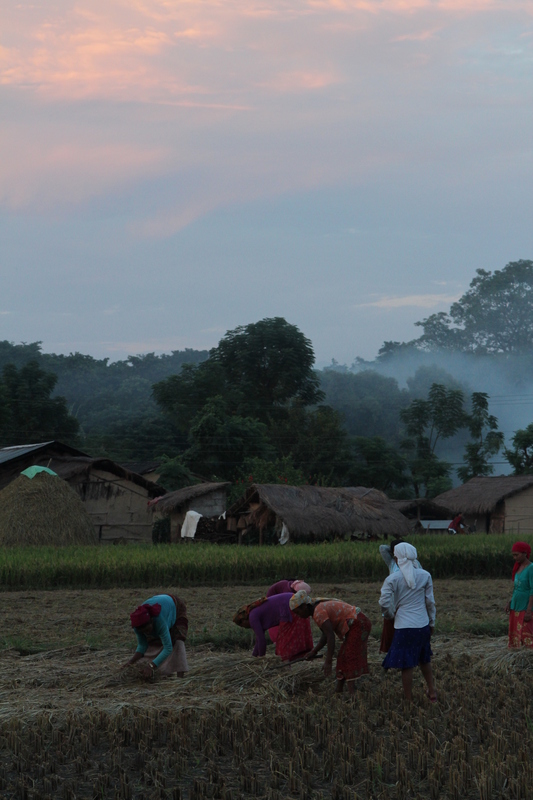 In the low lying terai jungle lands of Nepal lies the city of Chitwan. A dusty concrete maze pulsing with the ebb and flow of industry and homelessness, prosperity and poverty. The cacophony of sound echoing from the wide and cluttered streets a stark contrast to the quiet farming villages that surround it, providing the city’s lifeblood in the form of goods and produce. The bright green rice fields dotted with small homes and carved by black winding roads, stretch out on one side to the edge of the jungle and to the base of the snow capped Himalayan range to the other. The fields are tended by hand, workers bent double with sickle in hand. There are many trials in village life, guided by a strong caste system that predetermines social placement and career prospects. Arguably though, the biggest issue is access. With little personal transport available and heavily restricted public transport, access to city employment, hospital care and education is difficult. In an age of information, the majority of homes in villages such as these still have no access to literature, higher education or even internet services. ‘Education is the key,’ says founder of registered Nepalese charity Volunteer for Community Development (VCD Nepal), Bikram Paudel. Working with local communities at grass roots level, Bikram and his team are able to provide the link between those who want to help and those who need it. VCD offers a range of volunteer placements across Nepal aiming to benefit communities in need and work towards sustainable change, including the recently launched Chitwan Library project. Since proposing the library project to the people of his home village in Chitwan, Bikram has been overwhelmed by community support. ‘Some if these families have children studying abroad and have no means to contact them without access to Internet, this library will provide a village communications hub, a meeting place, access to online education, education resources and literature. The possibilities it will open up for these communities are endless,’ Bikram explained. Many VCD Nepal Volunteers have already backed the project, donating money for ebooks, bookcases, desks, computers and chairs as well as helping to set up the facility and eco friendly trashcans outside. The library will be based in an existing building located next to a small temple in the village. VCD hope to employ a worker to oversee opening hours and assist community members with use of facilities. To read VCD Volunteer feedback, see their blog here.